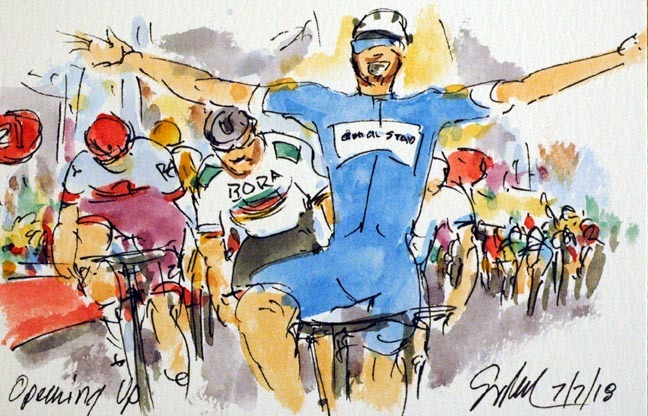 It was Fernando Gaviria (Quick Step) who opened up his account in the Tour de France. The Colombian sprinter (a country known more for its climbers) tooked his first stage victory in his first stage ever in the Tour! With his victory, he claims the Maillot Jaune of race leader, the Maillot Vert of most consistant sprinter, and the Maillot Blanc of best young rider. Now if he had only gone first over the only climb, he could have had all of the leaders jerseys. Just behind, in his World Champion's jersey was Peter Sagan (Bora-Hansgrohe), followed by Marcel Kittel (Katusha Alpecin) and Alexander Kristoff (Bahrain-Merida). Kristoff is in the European Champion's jersey. With a few more days of flat stages for the sprinters, we may be seeing quite a lot of this young Colombian. Given all of the races Quick Step has won, we will be seeing quite a few lead outs by the men in blue who call themselves the Wolf Pack.